“Always On.” Upon seeing these words for the first time in my Gear S2 display settings, I immediately believed that the name implies what it does: it keeps the screen on. After all, it was under “display” settings, so it should do as the name implied. I was wrong. Not completely, but partially. While the Gear S2’s Always On feature does keep something of the display on, it only keeps on certain details of the main display – not the watch face itself. In other words, no matter how attractive the watch face, selecting Always On will not keep the screen on permanently so that you can flaunt it to all your friends, family, and colleagues. 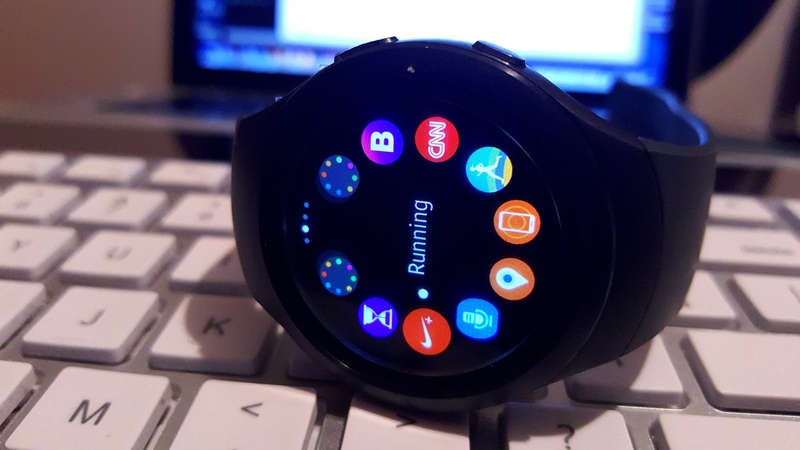 I don’t know why it is the case that Samsung decided to create this feature, and give it a name that would disappoint its fan base, but Always On keeps the time, date, and perhaps battery life “always on” – if you get the right kind of watch face. Otherwise, you’ll only see the watch hands if you select one of Samsung’s own pre-installed watch faces. If you make a trip to the Gear Apps Store and find a watch face that does more, you’ll have a more pleasant experience even when the screen is off. The user perspective regarding the Gear S2 matches what I thought above: if it’s under display settings, then the Gear S2’s display will stay on. Forever. Until the battery dies, of course. And yet, this is not what it means. Always On means that Samsung will keep certain information on the display visible, but not the watch face. That means that you’ll have to walk around with your watch face hidden from public view most of the time – even if you have the best-looking watch face your fellow Gear S2 user friends have ever seen. It seems that Samsung could have either 1) prevented screen timeout permanently, or 2) renamed this feature something else, such as “reduced display” or “power-saving display” (or “power display”). Naming this feature “Always On” creates problems for users when, to their disappointment, Samsung’s Gear S2 doesn’t let you keep the display on and show off your watch face. And the disappointment with a gorgeous watch face that is hidden by a black screen with a few features on it brings up another excellent point: why make the Gear S2 your own with a customized watch face (which Samsung wants you to do; just check your Gear Manager app settings) if you can’t showcase the circular display? After all, the Gear S2’s display is one of the best parts about the smartwatch, not forgetting the rotating bezel, of course. As with smartphones, smartwatches showcase displays, and displays are the first point of observation with those you meet. If you have this amazing watch face, but it’s covered by a black screen with a few details, how can anyone see your individual, artistic expression? If you can’t flaunt your watch face, then, what is the point of giving it your own creative flair? It’s the equivalent of a sculptor who sculpts a statue, then keeps it hidden under a long piece of cloth in her basement 23 hours a day. If she doesn’t showcase it, what’s the point of crafting it in the first place? The Gear S2 is a magnificent smartwatch, and it’s the best one Samsung has ever made, but its distinctions can’t be showcased if they’re hidden behind a black screen. Samsung’s Always On feature is designed to save battery life with sufficient information, but it doesn’t take a risk in anything but looks when you consider that all the good stuff within the software must be subjected to the black display in order to maintain some form of endurance. To the user, “Always On” means that the screen won’t time out on him or her, and we’d like to see Samsung implement a true Always On feature in the Gear S3. First impressions are everything when it comes to attracting new users, and we want new consumers to see the Gear S2 from afar and think to themselves, “I’ve gotta have it.” Beauty is in the eye of the beholder, but we’re not so sure that black screens attract.